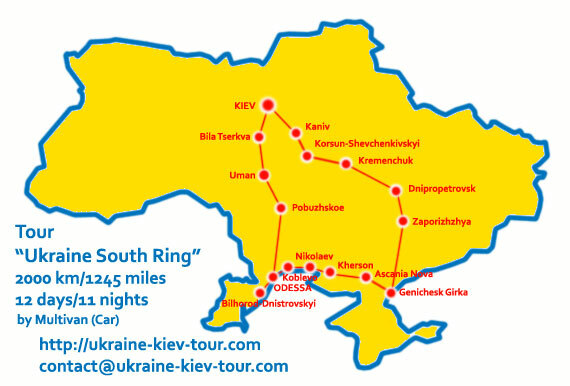 Ukraine Tour | Tour "Ukraine South Ring"
Ukraine Tour "Ukraine South Ring" is for active tourists who want to see most interesting sights in South Ukraine. You spend 10 days and 9 nights in high rhythm of Ukrainian life and culture. You travel around Ukraine over 2000 km/1245 miles by comfortable transportation and enjoy Ukrainian food, wine and people on the way. We try the best you have Perfect Travel Memories about Ukraine and Ukrainian people. You are welcome to Ukraine! Transfer to Uman. On the way visiting Zhashkiv Stud Farm with horse riding (optional). Walking tour in Park of Love - Sofiyivka Park. Night in hotel. Transfer to Pobuzke. Visiting of Strategic Missile Forces museum as military heritage of the USSR. Transfer to Odessa. Evening walking tour around Odessa. Optional opportunity to visit the opera in Odessa Opera House. Night in hotel. Walking tour of sights in Odessa: Opera House, Deribasovskaya Street, Primorsky Boulevard, Monument to Duke de Richelieu, Passage Hotel, Archaeological Museum, Panteleimon Monastery (Athos yard), Odessa sea port, Home with Atlanteans, Vorontsov Palace, "Privoz" market, City Council, Trinity Cathedral, Flat house, Transfiguration Cathedral, Teschin bridge (Mother-in-law bridge), Shah Palace, New Market (Philharmonic), Odessa factory of sparkling wines (optional activity), Monument to Orange, funicular, Darth Vader Monument. Night in hotel. Transfer to Bilhorod-Dnistrovskyi. Visit Bilhorod-Dnistrovskyi Castle (Akkerman fortress) and ancient Greek city of Tyre. On your wish swimming in the underground John Suchavsky Church. Transfer to Odessa. 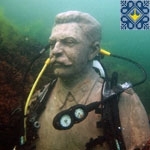 Arcadia walk and on your wish swimming in Black Sea or scuba diving tour to Underwater Museum of USSR Leaders (optional activity). Night in hotel. Transfer to Nikolaev. On the way visiting of Robot KB-1 TIS in Port Yuzhny. Nikolaev Sights: Nikolaev Zoo, Cathedral of Our Lady of Kasperovska, Flotskiy Avenue, Ukrainian Disneyland - The Playground "Fairy Tale", Church of St. Joseph, Shukhov Tower (Tesla Tower). Transfer to Kherson. Kherson Sights: St. Catherine's Cathedral, Frigate (Monument Shipyard), Greek Sophia Church, Potemkin monument, Fountain "Dandelion", Dnieper (Dnipro) embankment. Optional Peatland Extreme Ride at Green Farms Park or Hydrofoil Cruise by route Kherson - Hola Pristan - Kherson. Transfer to Ascania Nova Biosphere Reserve. Night in hotel. In Kherson there is optional day tour of sailing on medieval Rook Freya or Dzharylhach Island Tours. Ascania Nova Biosphere Reserves Botanic Park. 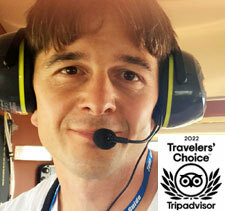 Optional tours on your decision: Protected steppe, Zoo, Chapelsky Pod area. Transfer to Genichesk Girka: Swimming in the baths "Arabatskaya arrow" on the basis of source of natural mineral water from the well depth of 1600 meters. Transfer to Melitopol. Night in hotel. Transfer to Botievo Wind Farm for sightseeing tour of the largest wind turbine farm in Ukraine - 65 wind turbines on the shore of Azov Sea (optional tour). On the way visiting of Kamyana Mohyla in Terpinnya. Transfer to Zaporizhzhya. Sights of Zaporizhzhya: Khortytsya Island, DnieproGES, Museum of Zaporizhzhya Cossacks, Zaporizhzhya Cossacks Equestrian Theatre (show is possible depends on number of people in the tourist group), Zaporizhzhya Oak, Antique-Car Museum Phaeton, Motorsich Museum of Aircraft and Helicopter Engines, Seagull Ship Museum (Museum of Dnieper flotilla). You can jump on the rope from Iron Bridge in Zaporizhzhya (optional). Optional Zaporizhzhya Helicopter Tour. Night in hotel. Transfer to Dnipropetrovsk. On the way visit of Shiroke Airfield with observation of Aero L-29 Delfin - 59 aircrafts, Antonov An-2 - 13 aircrafts, Mil Mi-2 - 18 helicopters, Mil Mi-8 - 1 helicopter, Antonov An-24T - 1 aircraft, PZL-104 Wilga - 2 aircrafts. Sights in Dnipropetrovsk: Monastic Island, Transfiguration Cathedral, Marx Prospect, Trinity Cathedral, Bryansk (Nicholas) Church, Dnipropetrovsk embankment, Ekaterynoslavsk (European) boulevard, Globa Park, unique Family Bench, USSR cars museum "Time Machine Cars". Transfer to Novomoskovsk. Sights of Novomoskovsk: Wooden Nine-Dome Holy Trinity Cathedral (1778), Samara Monastery and Salty Estuary. Transfer to Petrykivka. Visting famous Decorative Art Painting Center of Petrykivka. Transfer to Dniprodzerzhynsk. Sights of Dniprodzerzhynsk: Church of St.Nicholas and Nicholas Cathedral. Transfer to Kremenchuk. On the way with visiting natural monument "Glacial Boulders" in Domotkan and Intercession Church in Kamyani Potoki. Night in hotel. After Dnipropetrovsk there is optional day tour to Kryvyi Rih for descent into Deapest Mine in Europe - Lenin Mine with depth of 1406 meters, open mine UGOK and Kryvyi Rih Aviation Museum for sightseeing of unique aircraft Tupolev TU-114 with visiting cockpit and passengers salon. Transfer to Chyhyryn. Sights of Chyhyryn: Zamkovaya mountain and Kazan Cathedral. Transfer to Subbotiv. Sights of Subbotiv: Elias Church (Church of Bohdan Khmelnitskiy). Visiting Cold Jar in Medvedevka, Motronynskyy monastery in Melnyky and Zalyznyak Oak (1000-1200 years old) in Buda. Transfer to Cherkasy. Sight of Cherkassy: Shukhov tower, Mother Motherland, St Mikhail Cathedral, Monument to Plumber, Sherbina house, Slavyanskaya hotel. Transfer to Korsun-Shevchenkivskiy. Sights of Korsun-Shevchenkovskiy: Lopukhins Palace and Rosich Monument. Night in hotel. Transfer to Kaniv. Sights of Kaniv: Tarasova (Chernecha) mountain, Uspensky Cathedral, Monument to Heroes of Armor Trains. Transfer to Rzhyschiv. On the way visiting Chuchin Settlement (Bukrinsky Bridgehead) in Balyko-Schuchinka. Transfer by boat to Flooded Church that is on the island of Dnipro river (optional activity, depends on weather conditions). Transfer to Trypillia. Visiting Archaeological Museum. Transfer to Kiev (Optional you could have transfer from Trypillia to Kiev by sailboat on Dnieper river depends on weather and the season). 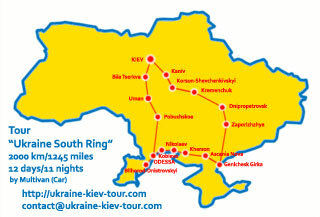 Optional activities after tour "Ukraine South Ring"
Day tour to Pirogovo Open Air Museum and Feofaniya Park. Minimum number of tourists - 2 persons. 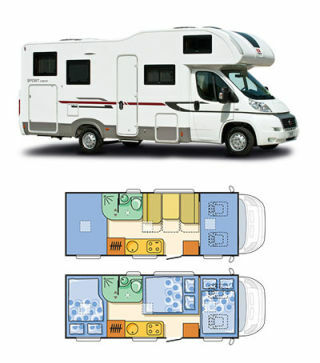 1997 EUR per person (4 stars*). * - Hotels in Uman, Askania Nova, Kremenchuk, Korsun-Shevchenkovskiy are 3 stars. If you want to change the Itinerary of the tour and visit some more cities of Ukraine or look more sights of Ukraine, please, let us know - we could make the tour more flexible. The tour itinerary could be change during the tour depends on situation and weather conditions.